For other uses, see Sleight of hand (disambiguation). A cardsharp using sleight of hand to win a game of cards. Because of its heavy use and practice by magicians, sleight of hand is often confused as a branch of magic, but is in reality a separate genre of entertainment, as many artists practice sleight of hand without the slightest interest in magic. Sleight of hand pioneers with worldwide acclaim include Dan and Dave, Ricky Jay, David Copperfield, Yann Frisch, Norbert Ferré, Dai Vernon, Cardini and Tony Slydini. The word sleight, meaning "the use of dexterity or cunning, especially so as to deceive", comes from the Old Norse. The phrase sleight of hand means "quick fingers" or "trickster fingers". Common synonyms of Latin and French include prestidigitation and legerdemain respectively. Seneca the Younger, philosopher of the Silver Age of Latin literature, famously compared rhetorical techniques and illusionist techniques. Sleight of hand is often used in close-up magic, where the sleights are performed with the audience close to the magician, usually in physical contact or within 3 to 4 m (9.8 to 13.1 ft). This close contact eliminate theories of fake audience members and the use of gimmicks. It makes use of everyday items as props, such as cards, coins, rubber bands, paper, phones and even saltshakers. A well-performed sleight looks like an ordinary, natural and completely innocent gesture, change in hand-position or body posture. In addition to manual dexterity, sleight of hand in close-up magic depends on the use of psychology, timing, misdirection, and natural choreography in accomplishing a magical effect. Sleight of hand during stage magic performances is not common, as most magic events and stunts are performed with objects visible to a much larger audience, but is nevertheless done occasionally by many stage performers. The most common magic tricks performed with sleight of hand on stage are rope manipulations and card tricks, with the first typically being done with a member of the audience to rule out the possibility of stooges and the latter primarily being done on a table while a camera is live-recording, allowing the rest of audience to see the performance on a big screen. Worldwide acclaimed stage magician David Copperfield often includes illusions featuring sleight of hand in his stage shows. Although being mostly used for entertainment and comedy purposes, sleight of hand is also notoriously used to cheat at casinos and gambling facilities throughout the world. Common ways to professionally cheat at card games using sleight of hand include palming, switching, ditching, and stealing cards from the table. Such techniques involve extreme misdirection and years of practice. For these reasons, the term sleight of hand frequently carries negative associations of dishonesty and deceit at many gambling halls, and many magicians known around the world are publicly banned from casinos, such as British mentalist and close-up magician Derren Brown, who is banned from every casino in Britain. Unlike card tricks done on the streets or on stage and card cheating, cardistry is solely about impressing without illusions, deceit, misdirection and other elements commonly used in card tricks and card cheating. Cardistry, or card flourishes, are always intended to be visually impressive and appear extremely difficult to perform. 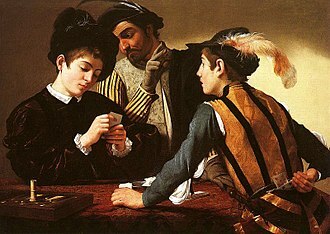 Card flourishing is often associated with card tricks, but many sleight of hand artists perform flourishing without considering themselves magicians or having any real interest in card tricks. The art of card throwing generally consist of throwing standard playing cards with excessively high speed and accuracy, powerful enough to slice fruits like carrots and even melons. Like flourishing, throwing cards are meant to be visibly impressive and does not include magic elements. Magician Ricky Jay popularized throwing cards within the sleight of hand industry with the release of his 1977 book entitled Cards as Weapons, which was met with large sales and critical acclaim. 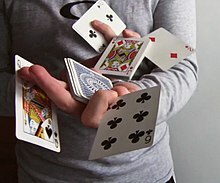 Some magic tricks, both close-up and on stage, are heavily connected to throwing cards. ^ a b c Oxford Dictionary 2015. ^ Whaley & Bell 1991, p. 314. ^ a b c Longe 2003, p. 9. ^ a b Henry 1975, pp. 495–498. ^ Ostovich & Hopkins 2014, pp. 114–116. ^ Scarne 2003, p. 236. ^ a b Forbes 2008. ^ a b c Jones 2007, pp. 54–55. ^ a b c Tarr 1976, pp. 59, 89. ^ Jay 2008, pp. 91–92. ^ a b Jay 2008, p. 90. ^ The New Yorker 1993. ^ Hugard & Braué 2012, pp. 43, 49. Henry, Hay (1975). Cyclopedia of Magic. Dover Publications. ISBN 978-0-486-21808-3. Hugard, Jean; Braué, Frederick, eds. (2012). The Royal Road to Card Magic. Courier Corporation. ISBN 978-0486156682. Jones, Jessica (2007). The Art of Cheating: A Nasty Little Book for Tricky Little Schemers and Their Helpless Victims. Simon and Schuster. ISBN 978-1416571384. Jay, Joshua (2008). Magic: The Complete Course. Workman Publishing. ISBN 978-0761159681. Longe, Robert (2003). Clever Close-up Magic. Sterling Publishing Company. ISBN 978-1402700279. Ostovich, Helen; Hopkins, Lisa, eds. (2014). Magical Transformations on the Early Modern English Stage. Ashgate Publishing. ISBN 978-1472432865. Scarne, John (2003). Scarne's Magic Tricks. Courier Corporation. ISBN 978-0486427799. Tarr, William (1976). Now You See It, Now You Don't! Lessons in Sleight of Hand. Vintage Books. ISBN 0-394-72202-7. Whaley, Barton; Bell, John, eds. (1991). Cheating and Deception. Transaction Publishers. ISBN 978-1412819435. Jones, Finn-Olaf (22 April 2006). "Houdini in the Desert". Forbes. Retrieved 26 February 2015. Singer, Mark (5 April 1993). "Ricky Jay's Magical Secrets". The New Yorker. Retrieved 26 February 2015. "Sleight". Oxford Dictionary. 2015. Retrieved 26 February 2015. Wells, Dominic (26 January 2008). "The Derren Brown Factor". The Times. Retrieved 26 February 2015.